Koi ponds make a great water feature for any home, giving you a little slice of aquatic wildlife in your own backyard, alongside all the soothing sounds and sights of a great water feature. Not only does it give you a great reason to head outside more, but it also provides another source of tranquility after a stressful day. However, both the installation and care of your pond and its fish are a bigger responsibility then you might think – this blog will help you understand what to expect when it comes to dealing with your new outdoor pets and their home. Depth: The pond should be around three feet deep. This is for a couple of reasons: this depth will allow the fish to avoid predators like raccoons, as well as help the pond not completely freeze during winter. Stability: The ground has to be able to support the weight of so much water. This may require the ground to be stabilized or reinforced with landscape materials. Water Pump: The pond is going to need a source of power for a water pump to circulate and filter the water, as well as provide a hookup for a water heater during the winter. Most people prefer a line to be dug from the house to the pond. Sunlight: It’s important to plan before you install the pond into your larger backyard landscape. To keep your koi happy and the water at a good temperature and healthy, make sure the pond can get 4 to 6 hours of sun each day. It’s important to treat your fish like pets and look out for their wellbeing. When introducing koi to a new pond, first make sure that the pond is ready to support them. Have the water tested for pH levels, nitrates, and ammonia. The pH should be around 7.5 – this is the sweet spot: values under 7 are considered acidic, values over 7 are considered alkaline. Nitrates and ammonia are toxic to fish, so both should be at 0. Levels should be checked weekly to start, twice a month after the first few months. With a new pond, buy koi in separate bags and let them float in the pond to equalize the temperature for at least 30 minutes. For adding new fish later: you need to quarantine them first for three weeks to avoid introducing anything nasty to your other fish. Keeping your pond safe for your fish is an ongoing responsibility. You will need to both monitor their health regularly, as well as provide specific maintenance for the season. For feeding consult your fish seller. Keep Debris Out of Your Pond: Especially in autumn, it’s important to keep leaves and other debris out of your pond to avoid covering the top or introducing materials to the pond that can change pH, nitrate, or ammonia levels. Dealing with a Frozen Pond: Consult your fish vendor for exact details on winter care for your fish. Some will be able to go dormant under the ice, while others should be kept active by use of a water heater. Check out our blog, Managing Fish Ponds During Winter, for full details. 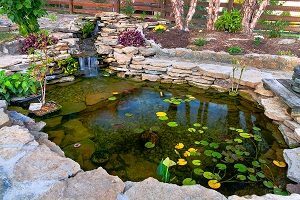 If you’re interested in landscaping a koi pond or other water feature into your backyard or augmenting existing fish ponds on your landscape, contact the landscaping experts at Greener Horizon. We can help you design the perfect pond, fountains, waterfalls, and more!